The Corrections Budget: Where’s the Empathy for Those Who Need it Most? The Corrections Budget: Where’s the Empathy? At the recent California Budget Project’s Raising the Bar Conference, an annual meeting of progressive leaders held in Sacramento, attendees worked to shape a policy agenda that creates shared prosperity in California. With an eye on the recent hard-won revenue increases and growing inequality across the state, the conference of over 300 individuals focused on strategies for reinvestment in vital services and equitable economic growth. A critical piece of the budget conversation—and one that SCOPE has been reporting on recently—is the redirection of funds for reinvestment to increased spending on corrections. In the proposed 2014-2015 state budget released last month, spending on corrections would be more than $1 billion above the 2012-2013 level. 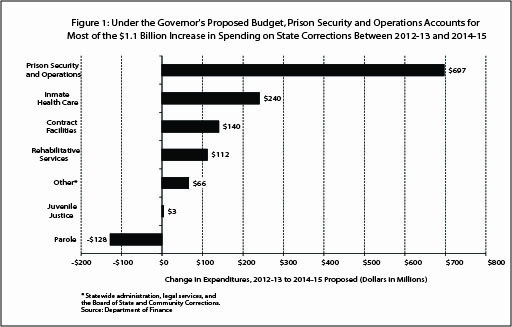 This increase, which would put the corrections budget at nearly $10 billion, is largely due to higher spending for prison security and operations. A few days before attending the conference, I read a letter written by Texas death row inmate Ray Jasper that had ignited a firestorm about how we view justice in the United States. His letter, published as part of the controversial “Postcards From the Edge” series on the online media site Gawker, was unvetted, making his perspective problematic at times. However the unapologetic frankness with which he speaks to the reality of structural racism—inside and outside of the criminal justice system—makes his account valuable to the conversation around justice and equity in policy formation and budget priorities. Given the open platform to share his perspective, Jasper chose to critique the criminal justice system from policing to sentencing and privatization, in order to emphasize a power imbalance driven by a fundamental lack of empathy in U.S. policy. Jasper writes, “ … we are being targeted more, instead of taught better. Ask any young black person their views on the police, I assure you their response will not be positive. Yet if you have something against the police, who represent the government, you cannot sit on a trial jury.” He says empathy is putting the shoe on the other foot, while imagining what it would be like to be judged by a true jury of his peers. With clarity, he expands on what is missing from our current policing and criminal justice systems, “Empathy. A rich man would look at a poor man, not with sympathy, feeling sorrow for the unfortunate poverty, but also not with contempt, feeling disdain for the man’s [im]poverish[ed] state, but with empathy, which means the rich man would put himself in the poor man’s shoes, feel what the poor man is feeling, and understand what it is to be the poor man.” I would add that this empathy gap is equally apparent in our fiscal policies. Presentation after presentation at Raising the Bar highlighted the stark and growing wealth inequality in California, followed by the decreasing funding for essential programs and services. And the crisis we are seeing occur at the state level is being replicated at the local level. As a moral document, the state budget needs more scrutiny, long-term vision, and perhaps mostly more empathy. The deeply structural inequality to which Jasper speaks to in his letter is upheld in our fiscal policy decisions. The persistent rise in prison spending isn’t solely a failure in rehabilitation and prevention efforts, but also a shortsighted redirection of scarce resources that could be used to strengthen the public safety net and reduce growing inequality in the years ahead. If our public resources are to be spent effectively and justly we must ask ourselves and our lawmakers: What does a future look like with these priorities leading the way?